Resources – How Do I look Up My Case, How Much is Bail/Where is My Loved One, What do I Do in Court? These sites are the sites I use most for my practice. It’s a good thing to do your own research. However, there are limits as to what can be done on your own. Some of these things include a jury trial, or running a motion where the evidence rules come into play. It’s important to to consult with an attorney who practices in Orange County who practices in the county that your case is in. Attorneys who practice in the county you are in will know the intricacies of the courthouse and courtroom. Google Maps: This tool doesn’t need an introduction. You will want to use Google Maps to get the location of the area you were arrested at. There are times where you will not remember how a place looks like and Google Maps will show an accurate description of how a particular corner looks like. In addition, legal professionals use it as exhibits for their cases and it is also a tool for pro pers to use as well. A person can bring this into traffic court to show for a variety of reasons. IE: show a different speed limit or the lack of a sign or a faulty sign. Legal professionals use Google maps to get pictures of locations. Also, this proves to be a useful tool to get an idea of how an area looks like. DMV Driver Safety Offices(For looking up numbers of driver safety offices) The Driver Safety Offices are the people who handle DUI Administrative Per Se hearing. These are the numbers legal professionals call behind the scenes. It’s important that you know what you are doing prior to calling these numbers and that you are well read up on the DMV Process. Inmate searches: Used if you want to find someone in jail. The following are some useful links for Criminal Defense Attorneys and the General Public. It is difficult to deal with things when a loved one is in jail, some of these resources may help. These resources are useful for finding a family member. Often times a person is taken in and are lost in the system. When this happens, it creates a stressful situation. You only need some basic information about a person. These tools are easy to use however sometimes you may not be able to find the person you are looking for. If that is the case, then you may need the service of a bail bondsman. Bail Resources: Each crime has a bail amount. A Bail amount is the amount of money left with the court to ensure that you will show up to court. These are more for the legal professional then the lay person. The local bondsman will be able to help you out with the process. The links below directs you to how much bail to expect for each crime in their respected counties. Case Searches: The following are sites to lookup a case. Some counties will give more access to your case than others. 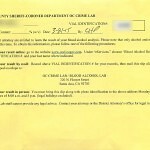 Crime Labs: Test results for both blood and breathe can be found online for Orange County. You will need your vial number and arrest date from the yellow sheet of paper. When dealing with your DUI it’s important that you have an attorney who is familiar with Orange County and watches the deadlines. For example, blood results do not come back for 10 days in Orange County. However, a person’s license will automatically suspended after 30 days if he does not initiate the DMV hearing, this would cause a problem if someone wants to see the test results first. People who lose have their license suspension due to a DUI will need a supplemental form of insurance for the purpose of getting a restricted license. There are companies out there who take advantage of this fact and overcharge. However, there are two reputable companies who do not take my clients for a ride. How Do I get back my license? What do I do with the suspension? CR 180 – Petition for dismissal of case. Los Angeles Metropolitan Courthouse – Some general information about the main courthouse for DUI in Los Angeles. Includes phone numbers, where to park, directs and how to handle security.